English physician; born in Odessa, Russia, 1837. He studied medicine at Kiev, Prague, and London (M.D., L.R.C.P., 1863), and then settled in Manchester as a practising physician. He is known as a successful practitioner and as a prolific writer of professional works, among which may be mentioned: "A Dictionary of Materia Medica and Therapeutics," London, 1868; "On Catalepsy," ib. 1869; "Asthma Nervosum," Manchester, 1877; "Electro-Therapeutics," London, 1883; "Massage," 1889; "The Dead and the Living," 1891; "Treatment of Diseases by Energy," Manchester, 1900. 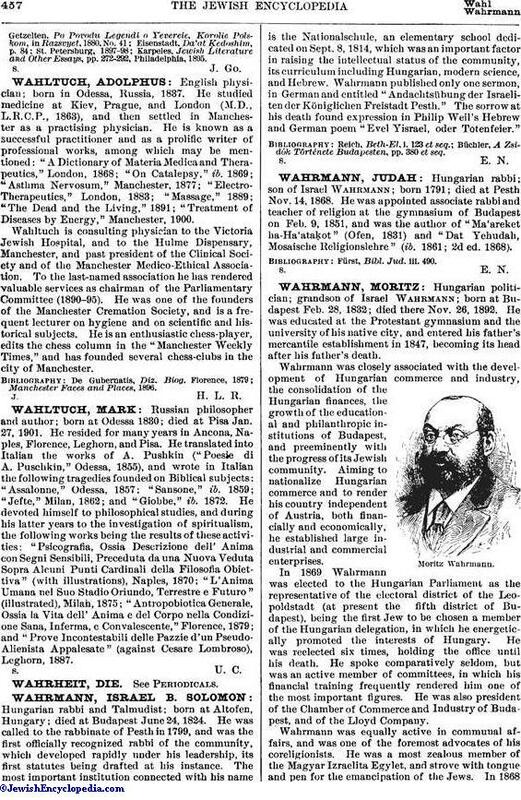 Wahltuch is consulting physician to the Victoria Jewish Hospital, and to the Hulme Dispensary, Manchester, and past president of the Clinical Society and of the Manchester Medico-Ethical Association. To the last-named association he has rendered valuable services as chairman of the Parliamentary Committee (1890-95). He was one of the founders of the Manchester Cremation Society, and is a frequent lecturer on hygiene and on scientific and historical subjects. He is an enthusiastic chess-player, edits the chess column in the "Manchester Weekly Times," and has founded several chess-clubs in the city of Manchester. Manchester Faces and Places, 1896.